How Do Glaciers Cause Erosion? A GLACIER IS A MASSIVE SHEET OF SNOW COVERED ICE THAT MOVES ACROSS A LANDSCAPE. Glaciers form in areas that are always covered by snow, so every year more snow falls than melts, creating a build up of snow. When the snow builds up the snow on top creates a lot of pressure on the snow underneath it which causes it to recrystallize and form into solid ice over time. CONTINENTAL GLACIERS ARE VERY LARGE AND FORM IN THE POLES. Instead of flowing downhill, they flow outward from the center of the mass. Continental glaciers form over thousands of years of snowfall pilling up and turning into ice. They are usually circular or oval. VALLEY GLACIERS FORM AT HIGH ELEVATIONS IN THE MOUNTAINS. 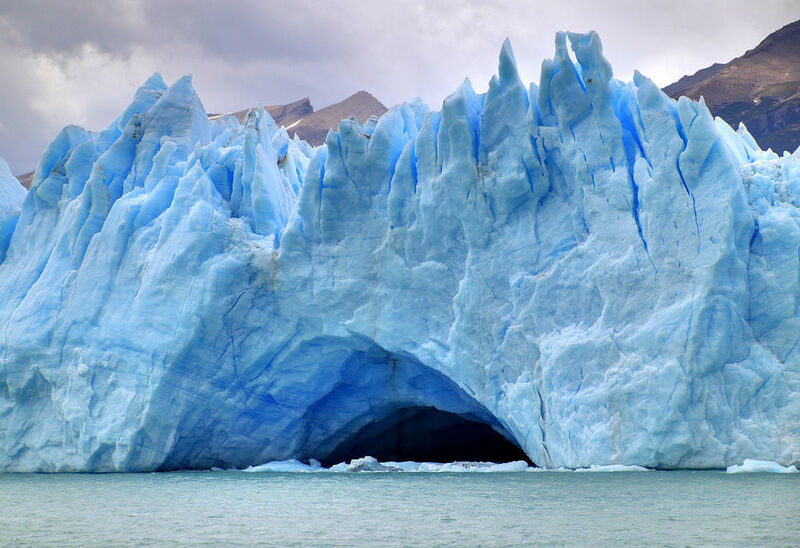 THE MOVEMENT OF GLACIERS IS CAUSED BY GRAVITY. The weight of the overlying layers of ice and snow push down on the lower layers of the glacier. This weight also causes grains of ice to partially melt and refreeze. As this happens, the ice grains slip over each other, and the glacier moves. The downward push causes the glacier to be constantly moving outward or downward. However, glaciers do not always advance, in fact many of them are retreating. IF THE GLACIER IS MOVING DOWNWARD FASTER THAN IT MELTS, IT IS ADVANCING. IF THE GLACIER MELTS FASTER THAN IT ADVANCES, IT IS RETREATING. How Do Glaciers Erode Rock? AS THEY FLOW ACROSS A LANDSCAPE GLACIERS PICK UP EVERYTHING IN THEIR PATH, FROM SAND GRAINS TO GIANT BOULDERS. These rocks and sediment get frozen into the bottom of the glacier and carried along with it as it moves. The rocks stuck in the bottom of the glacier get dragged over the bedrock by the forward motion of the glacier. They polish the bedrock making it smooth. They cut long parallel grooves in the bedrock called striations. These are important because the can indicate the direction the glacier was traveling. The rocks carried inside the glacier go through abrasion as they are dragged over the bedrock. UNLIKE RIVER ABRASION, GLACIAL ABRASION MAKES THE ROCKS BECOME SHARP AND JAGGED.